The match against Fulham wasn't quite a 'Game of two halves', but there was certainly a marked contrast before and after Sinclair's goal, prior to the goal Fulham appeared happy enough to let Swansea dictate the tempo for large periods and although Swansea created some decent chances another 0-0 wouldn't have surprised too many people. 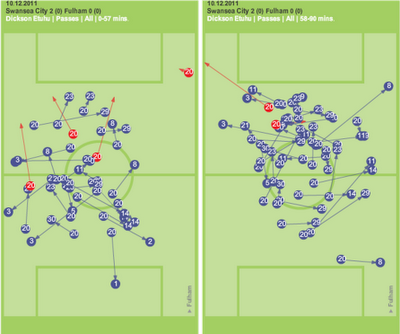 After the goal, the combination of greater Fulham urgency along with inevitable Swansea nerves meant that the last half hour was largely Fulham's punctuated by breakaway opportunities for Swansea such as the one that came to Graham on 80 minutes caused by Fulham leaving space at the back. 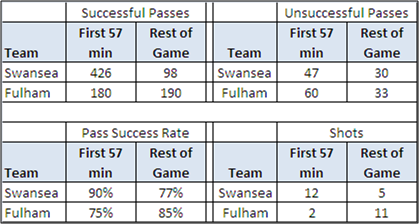 The figures below show the changes in activity pre and post Sinclair's goal, in particular Fulham managed just two attempts on goal in the first 57 minutes but 11 in the remainder of the game. Although Vorm made a number of excellent saves prior to the penalty, it is hard to overstate the importance of that penalty save. When winning games becomes a relief rather than the norm that it has been in recent seasons, to have dropped two (or maybe even three) points in this game would have put even more pressure on the team. For me, the penalty was played for but arguably the correct decision. 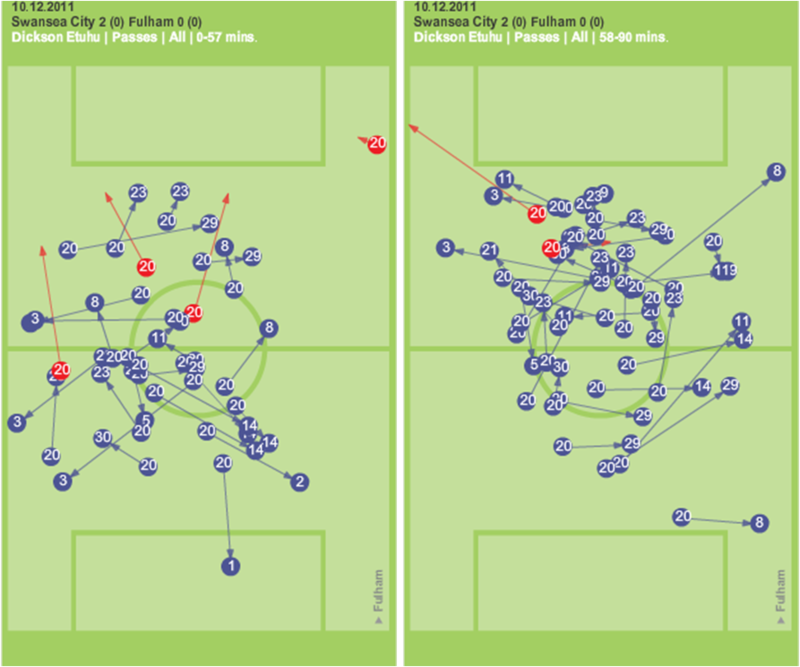 Richards' legs don't move an awful lot but his body does move towards the Fulham player and especially at full speed is enough to suggest a foul occurs. 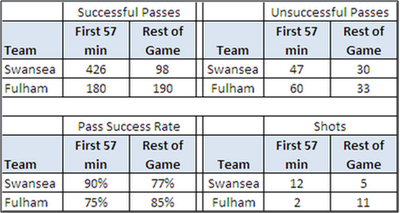 The main point of interest for me around the penalty wasn't Vorm's save but Ashley Williams' positioning. He was deliberately encroaching the penalty area as Dempsey went to take the penalty with the view to move out of the box as Dempsey ran up to the ball so as to be outside the box when the ball was struck. This to me seems a risky tactic, I don't know if the aim is to put Dempsey off or possibly influence Dempsey to strike the penalty away from the side Williams is standing but strictly speaking the referee should order a retake (and probably book Williams), although it'd take an incredibly brave referee to do so. It's probably the kind of thing you can get away with once but make a habit of it and sooner or later you'll get pulled up for it.